WATERLOO – Wilfrid Laurier University will welcome community members to tour its science building, science labs and Waterloo campus, and to explore a new exhibit titled, “#DistractinglyHonest: an interactive photo-research exhibit on sexism in science,” on Saturday, Sept. 17 as part of Doors Open Waterloo Region 2016. Laurier will offer tours of its science building at King and Bricker streets every 15 minutes from 10 a.m. to 5 p.m. These tours will include chemistry and biology labs and an active learning classroom. 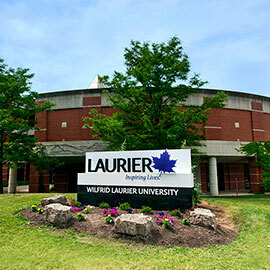 Guided tours of Laurier’s Waterloo campus will be held at 11 a.m. and 1 p.m., starting at the science building. With portraits featuring female scientists and their allies in visually stunning images, the #DistractinglyHonest exhibit highlights the challenges and successes of being a woman in science and presents research on sexism in science in a unique and provocative way. The exhibit includes opportunities for interactive feedback and conversations about the experiences of women in a male-dominated field, and gender in the science, technology, engineering and math (STEM) fields. The exhibit, which opens Sept. 15 in the atrium of Laurier’s science building, is by award-winning Laurier graduate student Eden Hennessey. #DistractinglyHonest is a follow up to an exhibit Hennessey held last year called #DistractinglySexist. Hennessy will discuss both exhibits with visitors as part of Doors Open Waterloo Region. “Laurier is proud to continue its partnership with Doors Open by showcasing a space that fits with this year’s theme of science and technology, and to provide our community with a chance to experience Laurier’s commitment to teaching and research excellence,” said Sheldon Pereira, director of University Community Relations. Doors Open Waterloo Region is part of Doors Open Ontario, a province-wide initiative of the Ontario Heritage Trust to celebrate community heritage and architecture. Since 2003, more than 250 sites in Waterloo Region have opened their doors to more than 100,000 visits during Doors Open. In 2015, Laurier featured its Cold Regions and Water Science building.